Two easy grilled steak marinade recipes both of which come with full bodied flavours that work perfectly with rump steak. 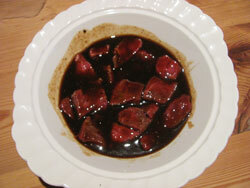 St Patrick's Day Marinade - it's full of Guinness and perfect for whole rump steak. This grilled steak marinade is full bodied with tamarind spice, not only does it add an amazing flavor, the tenderness of the steak was superb. 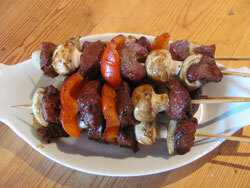 I made it up for some kebabs and the family loved it but it would work just as well on a straight steak. Note that other than the onion and garlic salt there isn't any other added salt. A small amount of salt will act to denature the proteins in the muscle and allow moisture (and flavour) to penetrate further than the surface, in other words this marinade is acting as a brine. Too much salt however will have to opposite (osmotic) effect and leach moisture out of the steak making it chewy and dry. If you can't get onion salt or garlic salt and want to simply add the respective powders then add ¼ teaspoon of salt to the marinade but no more. For this grilled steak marinade recipe I used diced rump steak because it's relatively fat free (and not as expensive as fillet steak) therefore ideal for the marinade to work on. There's enough marinade here to cover at least 500g or a pound of steak. Small cubes of steak have a greater surface area compared to a larger hunk of meat and all this surface area is available for the marinade to work on. Cover the bowl and marinade for 2 hours, you don't need to refrigerate during this time. Soak some bamboo skewers in water for 30 minutes prior to threading your kebabs. 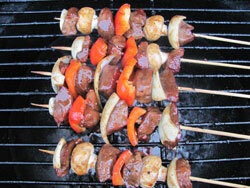 Thread the meat and veggie slices alternately onto the skewers. The veggies are important for cooking because they provide space between the pieces of meat so the heat from the grill can easier penetrate to the core of the meat. 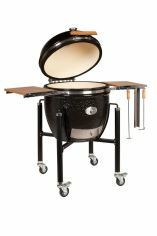 This means that you can cook your kebabs in less time and eliminate the risk of the outer shell of the steak being dry. Grill over medium hot heat for about 12 minutes turning occasionally and brushing on a little more marinade to help color the veggies. Now tuck in! What more is there to say than this is the perfect marinade for your St Patricks Day meal on March 17th. It's the acidity in the Guinness that helps this marinade deliver tender steaks and add flavour at the same time. All you need is some rump steak to bathe in the marinade. Alas, allergens abound in this grilled steak marinade because there will be gluten in the Guinness, soy sauce and the Worcestershire sauce. Also soy sauce is brewed from soya beans and Worcestershire sauce also contains fish. 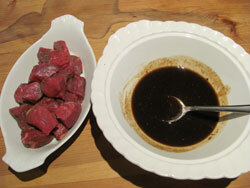 Mix up all the ingredients in a glass or earthenware shallow dish and place the steaks in the marinade. Marinate for approximately 2 hours and drink the rest of the can of Guinness! When your ready to cook make sure that your barbecue is good and hot, brush the grates with a little oil (be sparing so you don't get a flare up) and slap the steaks on. Use any remaining marinade to baste the steaks during to cooking. Use this link for my tips section on how to grill steaks. For serving I like to serve my steak with a green leaf salad and I don't mean to stereotype but a St Patrick's Day barbecue wouldn't be complete without some grilled potato halves.